Italian Scooter promo - circa 1960 - Oh Yeah!! 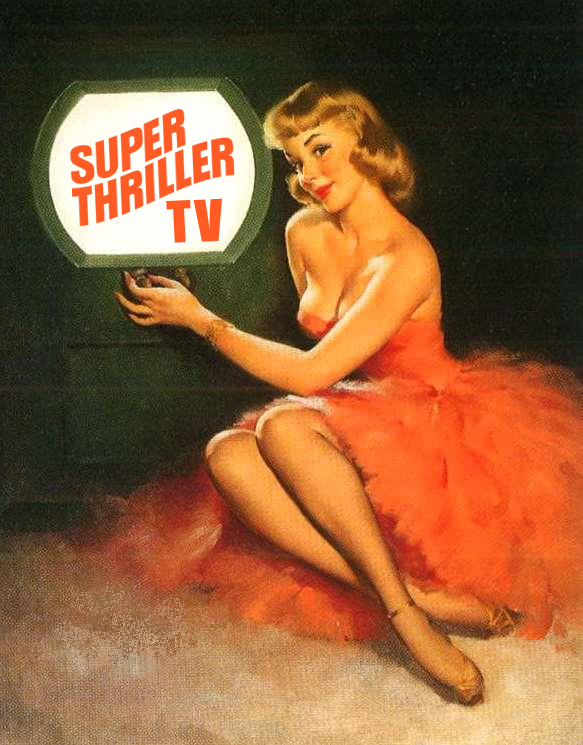 This is quintessentially Super Thriller! Russian treasure Edward Khil “singing” his Trololo song. Incredible music, beautiful lyrics, impeccable lip syncing and remarkable wig. Sit back and enjoy. The incredible RACHEL WELCH shakes it like she should, in true Super Thriller fashion. THE SMASHING PUMPKINS: FULL CIRCLE, aired on FOX 32, WFLD-TV Chicago on December 31, 2000 at 10:00 pm. Produced and Directed by Jock Hedblade & Lou Hinkhouse, it was that year's winner of the National Academy of Television Arts and Sciences' Emmy Award for Outstanding Achievement for an Entertainment Program. Moving beyond the typical cut-and-paste retrospective, FULL CIRCLE boasts intimate involvement of Smashing Pumpkins leader Billy Corgan, who partially initiated the project and granted WFLD an exclusive, in-depth interview a week before the band's final concert appearance on December 2nd. In addition, FULL CIRCLE offers viewers an ultra-rare glimpse of the band's very first performance before the cameras on their late 1980s, pre-stardom beginnings. The Smashing Pumpkins enjoyed a symbiotic relationship with Fox Chicago for many years. This joining prompted Corgan to contact another longtime associate and supporter, Metro nightclub owner Joe Shanahan, to involve Fox in the band's farewell salute. Through Shanahan, Fox Coordinating Producer and project producer and director Jock Hedblade along with project producer and Special Projects Editor Lou Hinkhouse set about organizing FULL CIRCLE with a vision of presenting a distinctly local perspective of Smashing Pumpkins' full career. The project gelled when Corgan entered the Fox studios a mere seven days before the band's final concert at Metro and settled in for a nearly two hour remarkably candid and reflective interview that will be the thrust of FULL CIRCLE. Though the story is compelling enough to tell itself, FULL CIRCLE is a unique retrospective not only for it's subject matter, but because the behind-the-scenes talent that pulled the project together have a special relationship with music in general and Smashing Pumpkins in particular. Hedblade's experience in video production made him the obvious choice for supervising and coordinating the project, but it was his vast knowledge and background in music that brought him to the fore to conduct interviews that tell the FULL CIRCLE story. Professionally, Hedblade spearheaded one of the nation's first Internet integrated music radio stations (The Web / WEBX-FM) while simultaneously serving as on-air talent and Music / Program director for the pioneering venture. While in this post, Hedblade and his brother Jay, prophetically predicted the hit singles that came from the Smashing Pumpkin's Melon Collie And The Infinite Sadness (SP) release when he reported "Tonight, Tonight" and "1979" to radio trade bible Gavin nearly 12 months before the songs became airwave staples. Hinkhouse also boasts impressive credentials in respect to Smashing Pumpkins. As the creator of the late 1980s award winning cable music series Pulse, Hinkhouse was at ground zero when the Pumpkins were developing their craft. Ahead of the pack in spotting the group's talent, Hinkhouse booked the band to perform on the show in 1988. That exclusive, never since seen footage, along with the band's first Metro appearance recorded for Pulse, is exclusivley featured in the special, making the title FULL CIRCLE a statement of fact over style. In addition to Corgan's exclusive interview and the coveted early footage, FULL CIRCLE will feature interviews with many music industry movers and shakers who have witnessed and participated in the band's assent to super stardom. Contributions from fellow musicians Rick Nielsen (Cheap Trick) and Nina Gordon (Veruca Salt), club-owner Joe Shanahan (Metro), rock critics Greg Kot (Chicago Tribune), Jim DeRogatis (Chicago Sun-Times), and Michael Harris (Illinois Entertainer), and radio programmers Norm Winer (WXRT) and James Vanaosdol (Q101) offer FULL CIRCLE an in-depth analysis of the band from those who have tracked their progress from gestation to bonafide rock idols. In all, FULL CIRCLE documents the extraordinary career of Smashing Pumpkins from an extraordinary hometown perspective, and promises to be the final word on one of Chicago's most important musical exports. Like the band's farewell that set the special in motion, FULL CIRCLE is certain to be an event onto itself.